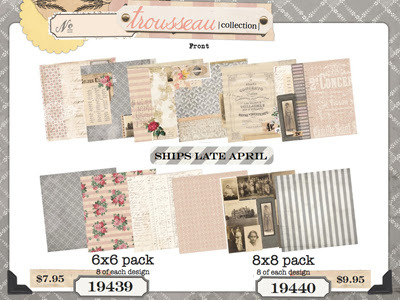 Today I have the second collection from 7gypsies, Trousseau. 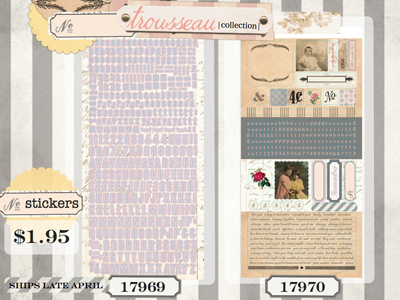 Totally different from the last collection (or any that we have done), feminine and very vintage. The pallet of peachy pink, grey and cream is beautiful. 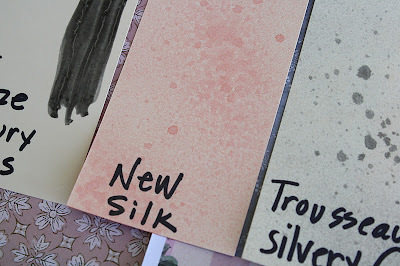 What I love about this paper is that you can use it as a whole sheet or cutout all the little bits to use for collage. There's even one whole sheet of old pictures to use in mixed media projects. This is a snippet of a layout I did using Charming. I cut parts of the paper design with an X-Acto knife and slipped the 5 x 7 picture underneath. It's almost like the word charming and the roses are holding the picture down. A little project I made with Always, Charming and Lovely (I will show you the rest when we return from the show). What you can see is more of the Tattered Angels spray - Satchel that I talked about yesterday. Love that color. I think these papers are going to darling in the smaller scales! 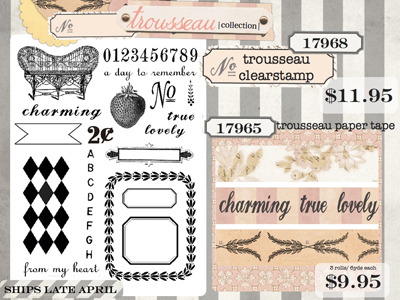 I love that big strawberry stamp! Here are some of my test strips of the spray. Love the pink alone but the pink and silver combined is also a great combo. 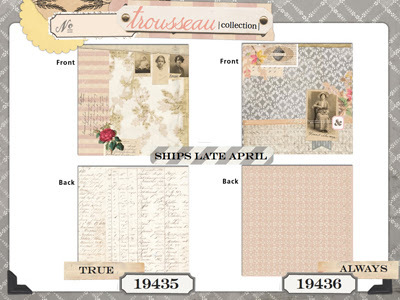 Tomorrow, more embellishments that were created for Trousseau (you know we have more of the tiny envelopes!) and one of the projects I created for the show. Now I have to get back to work...a good day for rain here in California. I won't be tempted to leave the house and I already know what's for lunch...Tomato soup. It's my go to rainy day meal. cheers for a great Monday! This color palate is divine. Thanks for sharing this! I can see I'd better start saving some pennies.....:). I normally don't buy scrapbook papers anymore because I prefer to find the original old items, but when they're this pretty I can be tempted to change my mind! Gorgeous! I can't wait to get my hands on these goodies!! Love this collection! It's perfect for a Mom/Grandma heritage mini i'm planning to make. Can't wait to see it in person. Thanks for the peek and have fun at CHA! 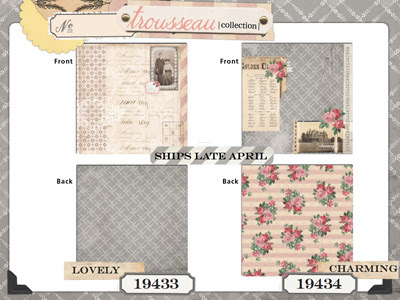 This is a gorgeous collection ... and i love the colour palette ... so soft and pretty! Wow, love this collection. 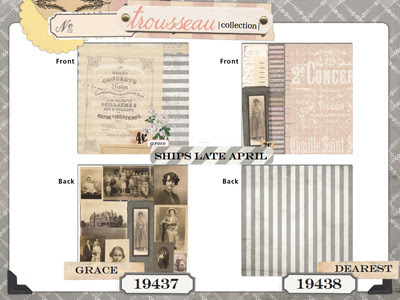 I love grey/white stripped paper, love the romantic style. My favorite line, can't wait to see it! Wonderful Collection-- not stereotypical at all. I remember you telling us the story of the giant strawberries in class last year (Johannesburg, Sept 2011). Enjoy CHA, we will be "watching" from afar. So very different - I love it! Thanks for sharing. Wow! Love the softness of this line. I'm thinking of all the ways I could use this in mixed media, which is my new favorite thing to do. Loooooove! I love everything 7Gypsies does. The new lines this year are fab!